Today is the launch of the third issue of Merry Mag, a magazine put together by the talented Melissa of the Sweet Escape and filled with amazing DIY projects, ideas and crafts by a roster of creative bloggers. I am very proud to count myself among the group and share with you my contribution to the magazine below. After you’ve taken a look, be sure to check out all the holiday projects and ideas in Merry Mag and follow along on social media via the hashtag #MerryMag — feel free to share your comments and your versions of the projects too! There’s always occasion for wine during the holidays! Not only is it great for drinking, it’s also good for giving, whether a basic bottle for a hostess gift or a special vintage as a Christmas present. All you have to do is wrap it pretty! Here are seven festive ways to dress up that bottle, from a simple bow and tag, to a DIY paper pinwheel. Most of these ideas should take you less than 10 minutes to do, so there’s no excuse for leaving that bottle in a paper bag anymore! You could even wrap several bottles ahead of time to have on hand for last-minute gifts. For the purposes of this project, I removed all the wine labels, but any of these ideas should work well with the labels still in place. For the prettiest results, select materials that coordinate with the wine label and cap colours. Whether you make them or buy them, a pair of tassels lend an instant celebratory air to a bottle of wine. (I made these ones from gold tissue paper; there are all sorts of tutorials online, like here, here and here — though you might want to make your tassels smaller.) Add a loop of twine or cord, and drape over the neck of the bottle and you’re done. If you want to give a bottle as a gift, this method works well because it completely hides the label. Roll the bottle in wrapping paper, fold in the bottom (add tape if needed), then pinch in the paper around the neck and tie with twine. To finish, add a label. Print seasonal greetings or the lyrics to a favourite Christmas song onto nice paper or cardstock, then trim to size and tape around the bottle. Play with fonts, point size and ink colour until you get a look you like, or sign up for my newsletter to get the free download of the one you see here. When trimming the paper, keep it tall enough to cover the wine label. For a fresh embellishment, wrap a long length of twine several times around a bottle to hold a sprig or two of rosemary in place. You could also use sage, cedar or other seasonal greenery. To finish, attach a label or gift tag. The most basic way to dress up a bottle is to simply add a gift tag and bow. To keep things from looking dull or old-fashioned, choose extra-wide ribbon and modern colours and patterns. The most complicated idea here, this DIY still takes less than 20 minutes to make (and less than 10, with practice). Follow the instructions here for how to make the pinwheel medallion (the pleated centre circle in the tutorial); cut a strip of paper about six-inches long and notch the ends; then layer the two pieces and attach to the bottle with Glue Dots or double-sided tape. 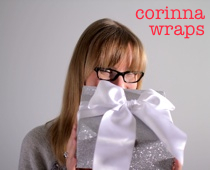 Want more gift wrapping ideas and inspiration this holiday season? Sign up for my newsletter! P.S. Don’t forget to check out Merry Mag for lots more holiday inspiration!